Grandma Slump: Hey, Aren't You Bela Lugosi? 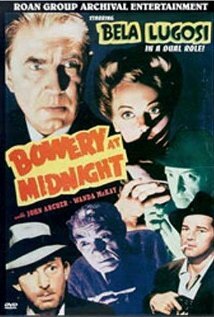 I'm watching a movie starring Bela Lugosi, called "Bowery at Midnight." I'm roughly a third of the way, midway somewhere. Like it says on the graphic, he's in a dual role. He plays Professor Frederick Brenner, a professor of psychology. There's a good scene where a student stands and gives a few answers on paranoia that, unbeknownst to him, stands as a description of his professor's other life. By night he portrays a kindly soup kitchen boss, generous to a fault. But it's a front for a criminal operation in which he uses some poor slob's criminal talents to help him along, then kills him. When it comes to Bela Lugosi, I'm a big fan. So I'm always rooting for him to win -- whether it's taking over the world or whatever -- all the while knowing the conventions of film-making dictate that he has to lose and good prevail. Very disappointing. But my beef tonight isn't that evil never gets a fair shake, but that the actual Bela Lugosi makes an appearance in this film, by way of movie poster. The cops are walking by a theater, which just happens to be showing Bela Lugosi's "The Corpse Vanishes"! Meaning Bela exists as the actual Bela, then this other guy, who just happens to look and sound precisely like Bela Lugosi. In my opinion, such things should not be. Bela shouldn't be existing in a world where his characters are running around. What would happen were they to meet? Would they fuse and become a super villain, who couldn't be stopped despite film conventions? In that case, it'd be all right. But I imagine a bad scenario, like the actual Bela vanishing and therefore all his despicable characters too. Look at the problem this would be for Brenner/Wagner. Not only does he always have to be on the lookout for the cops, but Lugosi fans as well. Because in fact he's going to get it everyday, "Aren't you Bela Lugosi? You look exactly like him. Your accent is precisely the same!" In short, the poster should not have been in the movie! One other case of this happening that I can think of is in Elvis Presley's "G.I. Blues," where Tulsa McLean (Elvis' character) plays a song on the jukebox ("Blue Suede Shoes") by "Elvis Presley." How can this be? What does that make Tulsa, an Elvis impersonator? The actual Elvis impersonating a guy impersonating Elvis? If Elvis actually exists in Tulsa's world, isn't it strange that people aren't coming around saying "Aren't you Elvis Presley? You look like him right down to the DNA!" But that doesn't happen in the movie, for some strange reason. You can't exist as two separate entities in the movies or TV. It doesn't work. You never watch "All My Children" and see them watching "All My Children".